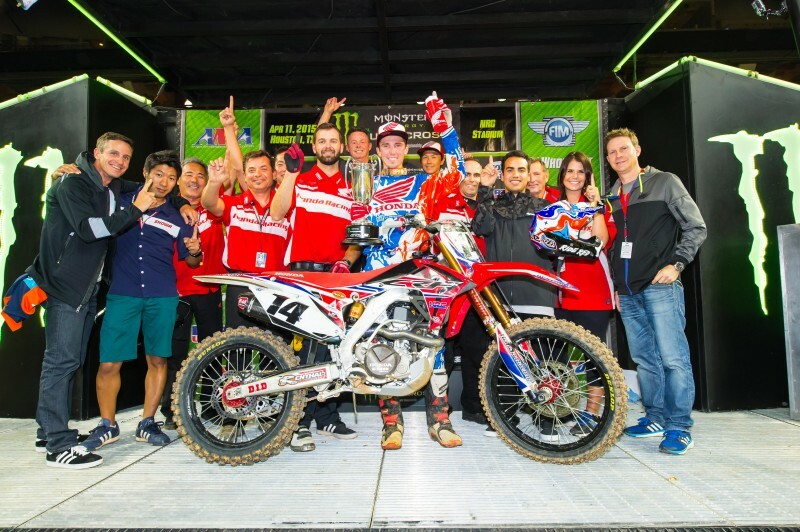 Round 14 of the AMA Supercross series was cause for celebration for Team Honda HRC crew, as Cole Seely turned in the best performance of his career, leading every lap of the main event en route to his first-ever 450SX victory. Seely got off the line to a great start and quickly overtook the two riders in front of him to assume the early lead. 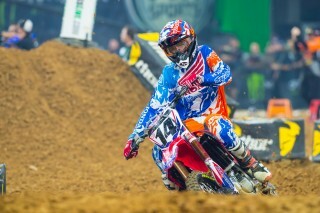 Once out front, the premier-class rookie rode more like a veteran, setting an unmatchable pace that at one point carried him to an impressive 12-second advantage over second place. 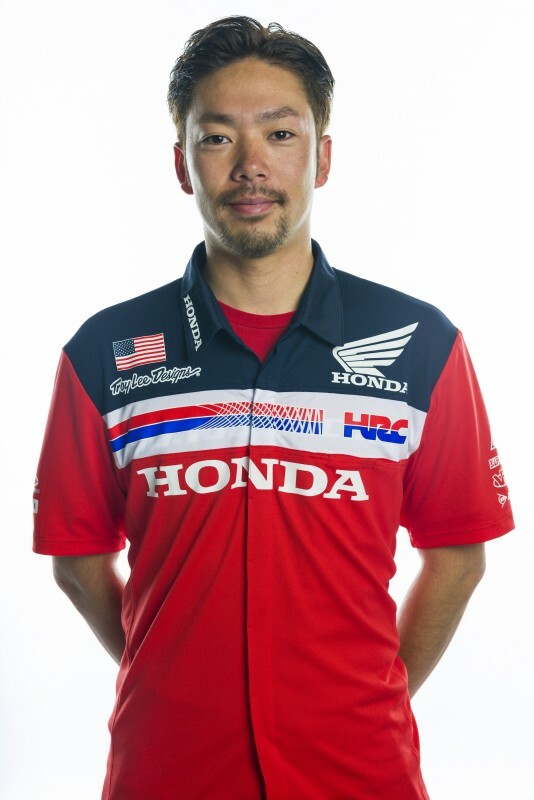 His solid performance advanced him to third place in the championship points chase. Joining Seely on the podium was GEICO Honda rider Eli Tomac, who battled his way through the field following a mid-pack start, eventually finishing third. The night before race day, Team Honda HRC’s Cole Seely and GEICO Honda’s Matt Bisceglia attended an autograph session at local dealership Honda of Houston. 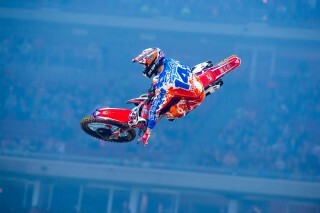 During the daytime qualifying practice, a mere 0.326 seconds separated the top three riders. 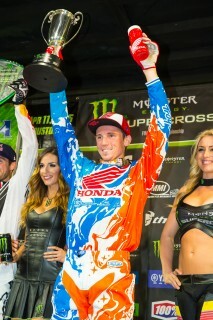 Tomac was quickest with a best lap time of 45.204 seconds, while Seely’s 45.530-second lap was good enough for third. Assigned to the second heat race, Seely launched his CRF450R off the line to a second-place start, made a pass stick on lap two and rode unchallenged the remainder of the race, logging the fastest lap time along the way. 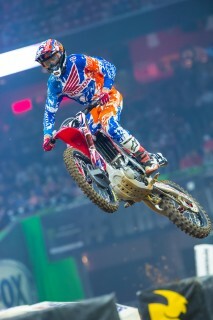 Tomac was in the same race but struggled off the start and was forced to transfer through the second semi. On his way to the win in the 20-lap main event, Seely clicked off the fastest lap of the race with an impressive 46.430, over .7 seconds better than the next-best time. 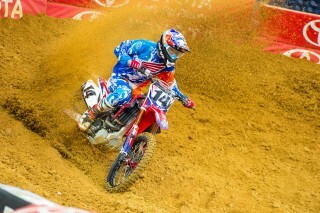 Seely was the only rider to dip into the 46-second range. Whereas Ryan Dungey clinched the title in Houston, the Red Riders continue to occupy the next three positions in the points chase. 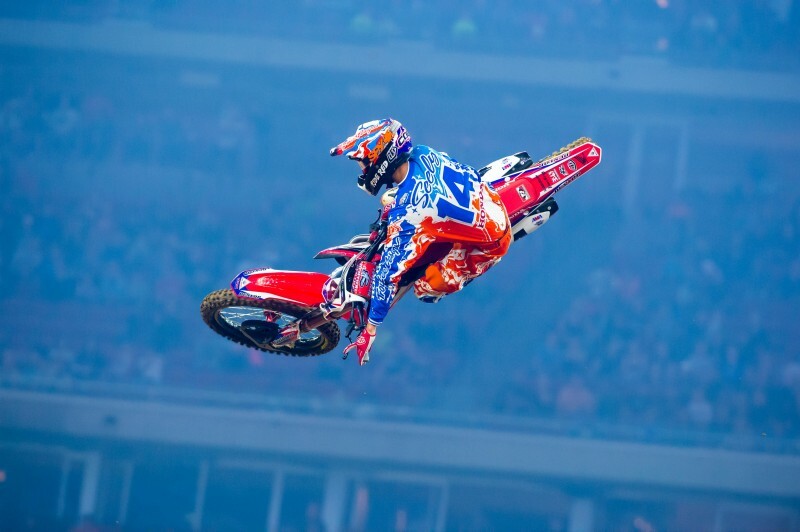 Tomac is second with 236 points, while Seely’s 223 moved him past injured teammate Trey Canard, who still holds fourth with 204. 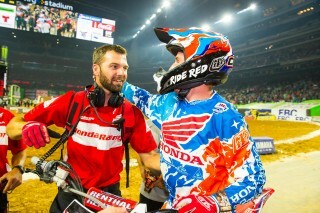 Seely is the second first-time winner in the 450SX class so far this season, with the first being Tomac in Phoenix. 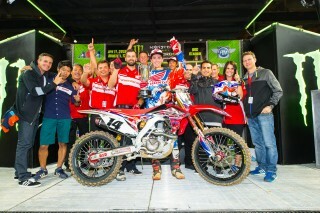 Since the beginning of the year, there has been at least one Honda CRF450R on the podium at every round, and three different Honda riders—Seely, Tomac and Canard—have scored a combined total of five wins. With Tomac taking third in Houston, it marked the fifth time this season that Honda riders have occupied two podium positions in a 450SX main event. 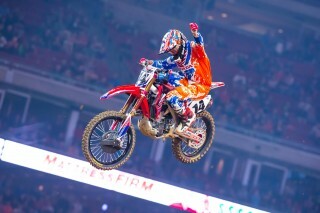 The feat was also accomplished at Anaheim 3, Atlanta 2, Indianapolis and Detroit, a list that includes four of the last six rounds. No other manufacturer has managed a double-podium so far this season. For round 15, the Honda Red Riders head west to California for the inaugural Santa Clara Supercross at Levi’s Stadium on Saturday, April 18. 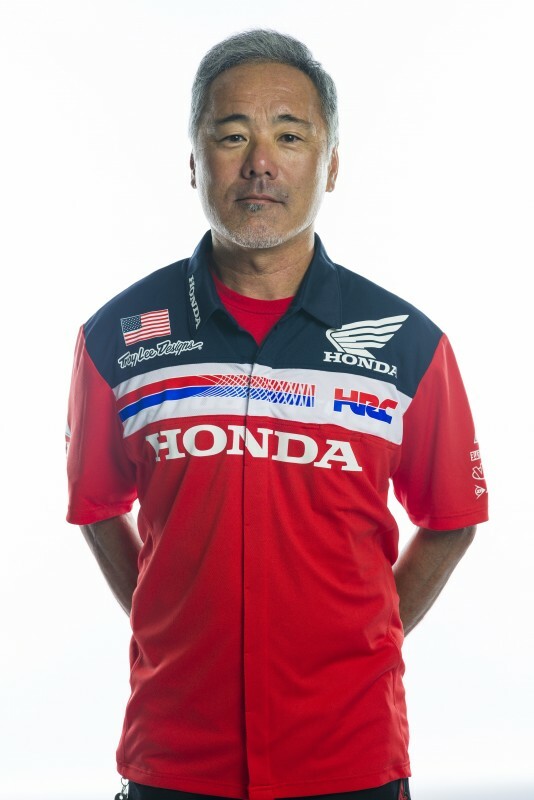 On Friday, Seely will join GEICO Honda riders Tomac, Bisceglia and Malcolm Stewart for an autograph signing at Fremont Honda. 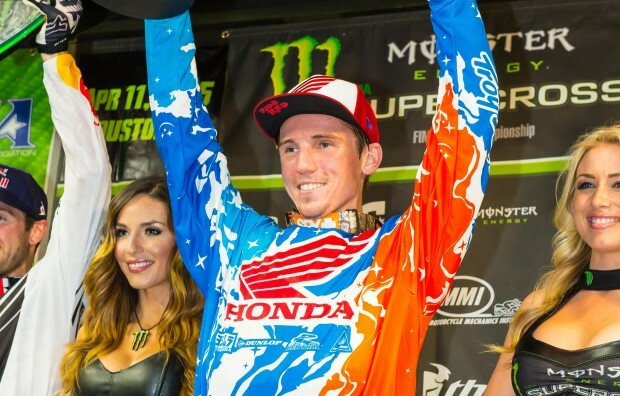 While Cole Seely’s debut 450SX win at Houston was a big deal for the Red Riders, it wasn’t the only good news out of Texas for Honda and HRC. 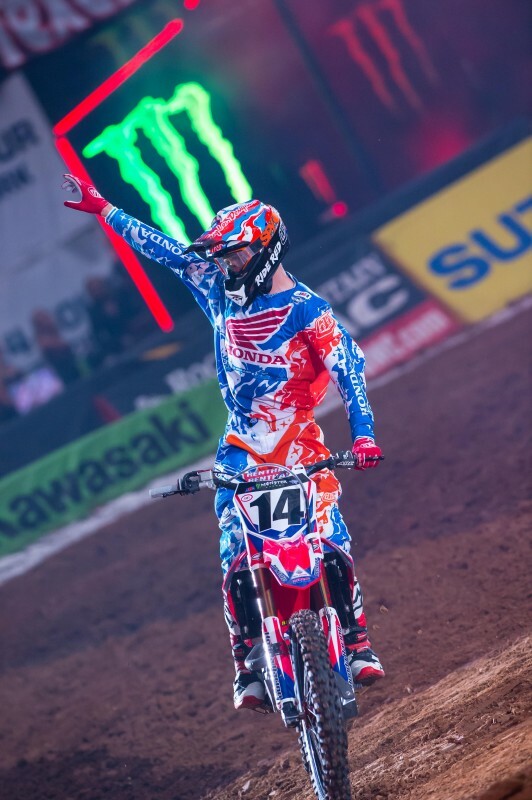 The day after that Supercross success, the factory Repsol Honda MotoGP team was victorious at its series’ second round, in Austin.